Featured in Los Angeles Times Travel Section. Fall in love with Quail's Nest. This cozy 1 bedroom, 1 bath cottage is nestled in a locale, where all is within walking distance. Stroll 3 blocks to Carmel River Beach and watch the aqua tinted waves rip through the air and crash right in front of you, or maybe you prefer to sink your feet into the white sands of popular Carmel Beach. Take a healthy stride of just over half a mile to the village, which is sprinkled with many unique shops, restaurants to satisfy every palette, and let the art galleries draw you in, or admire the antiquities staged in the windows. A brisk 2 block saunter can lead you to Clint Eastwood's Mission Ranch. Get acquainted with the distinctive homes of Carmel by the Sea, while cycling up and down the streets, bicycles are provided at your disposal. These activities can bring on an appetite, so step into the remodeled kitchen and prepare a light snack or a feast, this kitchen is sure to handle whatever you bring. chairs that add a homey feel, calming colors and print blend on the walls, and black and white photographs hang framed and hint of early Carmel. be livened and spark some romance, or how about just spoiling in front of its warmth. Don't forget to get in touch with nature by visiting Point Lobos, choose from several hikes and spot a deer with its fawn feeding on the lush greens, a red tailed hawk soaring above, or capture a quick glimpse of bob cat pouncing in play. Come visit the positive energy of Quail's Nest and invigorate your won't want to leave! I had looked for many years around the Carmel area and found the Carmel Point area the best spot. The area is mostly flat walking, with no big hills, Carmel Beach, Carmel Bird Sanctuary and Mission are a close walk away. The energy here is special. You are alone with your thoughts and it is a great spot to just think about life past/present/future. This is a healing, loving area. Wonderful vibe. Just before Christmas of 2015, we had the great fortune to be able to do a Quail's Nest getaway for the 3rd time. It feels much like a cozy home away from home, plus all of the added excursions surrounding the Nest. 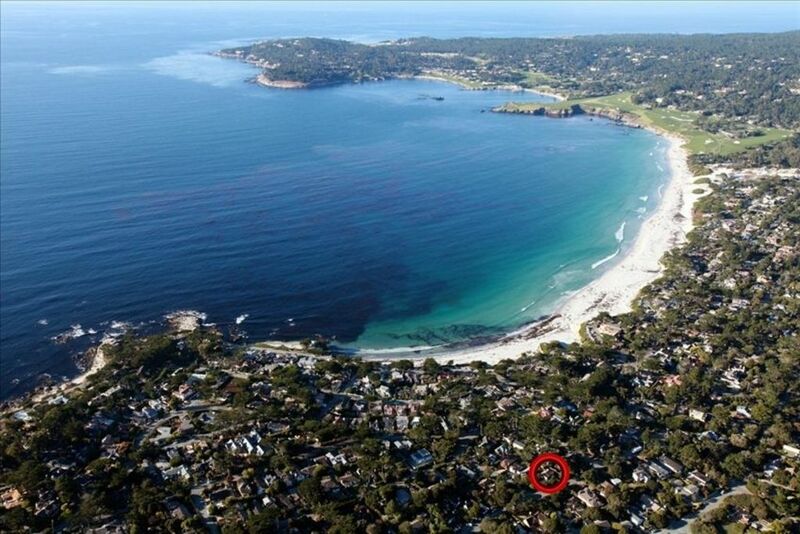 The entire city of Carmel, and the ocean are within walking distance. And on this trip our new experience was the nearby town of Pacific Grove, and its Monarch Butterfly Sanctuary. The day of our visit there were over 10,000 Monarchs on site (we know because we counted them.) Truly an amazing experience. Inside the Nest there's simply a feeling of "we're here! ", and a place you really want to be. We almost feel like the Blue Jays are there for us to personally feed each time. They're beautiful, incredible, and eat peanuts right out of your hand. The king size bed is so comfortable, you have to be careful or you might never want to get out of it. And there are plenty of extra blankets for when it's cold. The kitchen is perfect for two as we love fixing up our own healthy meals. The shower is hot, and absolutely everything is clean, clean clean. Erik is indeed a host extraordinaire, and we would recommend the Quail's Nest to anyone wanting a to find the perfect retreat. The property was rented for an adult daughter visiting us. She loved it! It was very well appointed and the location was excellent. She loved the outdoor spaces and found them very soothing. This is a little oasis. We have stayed in many VRBO properties over the years! Love, love, love this house! Erik the owner is top notch with everything. There were so many extras included! Starbucks coffee, chocolates, supplies if you forgot anything! The Carmel area is a great place to visit & we lived all of Erik's recomendations. Hiking, beach walking, sunsets, Big Sur, Point Lobos & feeding his birds! We thoroughly enjoyed our stay & we know we'll come back! Thank you! The reviews can't say enough and when you leave, The Nest spolis you for every other VBRO in town. We were lucky to get a last minute opening when our VBRO in BIg Sur did not live up to what was specified. Eric was terrific and met us and we fell in love. The house is comfortable and has everything one could need. Every detail you will need is listed in his reference book and more. We already booked for three weeks next year!!! You can walk everywhere and are surrounded by gorgeous houses with blooming gardens. I stayed at "The Nest" for a week. If it's available whenever I return to Carmel, this will be my first choice! It had everything I needed for my stay. It took a couple of days for the jays to get comfortable, then as Erik says, some will take the peanuts right out of your hand. My wife and I recently spent a wonderful week in lovely Carmel to celebrate a special wedding anniversary. We were quite pleased with Quail's Nest. The cottage is quaint, charming, cozy, comfortable, clean, and well located. It was stocked with everything a vacationer could require. We enjoyed feeding the resident blue jay and watching the family of quail proudly strutting on the street in front of the cottage. The owner was always available, but he totally respected our desire for privacy. Highly recommended! Featured in Los Angeles Travel Section. This cottage is located in the Carmel Point area of Carmel. Walking around Carmel Point is mostly flat. No big hills like near the village. Only 3/4 mile walk to the village, 3 blocks to Carmel Beach and 4 blocks to Carmel River Beach Bird Sanctuary.